A contemporary take on Cantonese cuisine with an artisanal cocktail programme. Mitzo breaks the mould of Chinese dining by combining a contemporary take on Cantonese cuisine with an artisanal cocktail programme. Located on the 4th floor, Mitzo is surrounded by full length windows that let in plenty of natural light, resulting in an atmosphere that is at once inviting and vibrant, while the experience remains intimate and casual. A key feature of Mitzo cuisine is staying true to the philosophy of Cantonese cuisine; focusing on the quality of ingredients and its execution, while retaining its familiarity and authenticity. Through the innovative use of ingredients, each visit brings with it new flavours and a different type of experience. Most dishes are designed for sharing, so guests can try a variety of offerings. At Mitzo, we take our drinks seriously. Cocktails and service are given the same attention to detail. The produce and herbs are carefully sourced and procured fresh daily. The cocktail experience at Mitzo nurtures innovation and honours tradition, pleasing the classic connoisseur as much as the modern maestro. The best seats in the house are arguably those at the Cocktail Atelier. With a 3 metre long jellyfish tank as backdrop, and illumination from the glittering bar top, the space is truly a vision to behold. This coveted space seats up to 6 and allows one to watch our cocktail craftsmen in action as they whip up delectable concoctions. The main dining area has a total capacity of 120 seats. The room is surrounded by windows offering natural daylight and is complemented by glass screens, a nod to the ubiquitous screens in Chinese culture. The restaurant is deep and long, with the space broken into sections, lending a more intimate feel to the dining experience. Mitzo’s design aesthetic is dramatic yet modern and neutral in its interpretation. 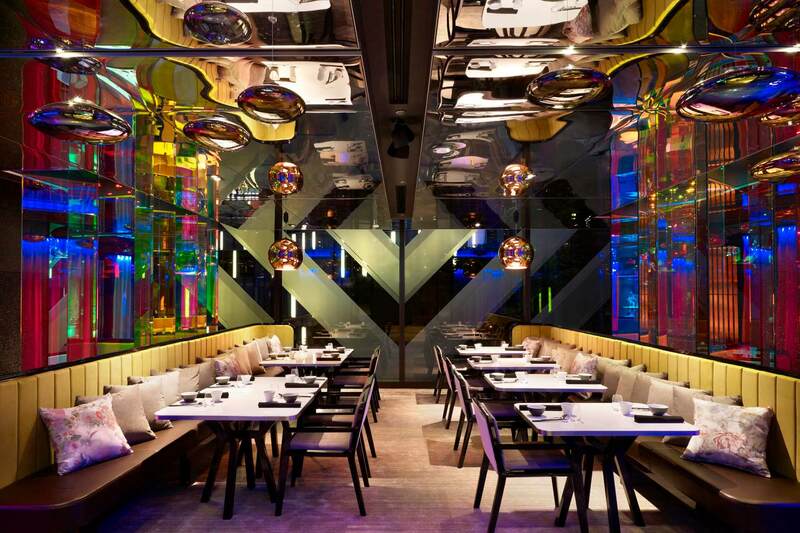 The space, beverage programme and service represent a progressive and new way of enjoying Cantonese cuisine. Kick-start your weekend with the ultimate Yum Cha experience at Mitzo with a heady mix of gastronomy, cocktails and champagne. The menu features over 40 selections of dim sum, wok dishes and supreme seafood delicacies comprising of Bamboo Clam, Live Lobster and Abalone dish. There is also a playroom to keep the kids entertained. $68++ per adult (food only) [ View Menu ] Kids under 6 dine free. 6 to 12 year-olds enjoy 50% off. Top up $60++ per person for free flow of cocktails, champagne, wines and beer.